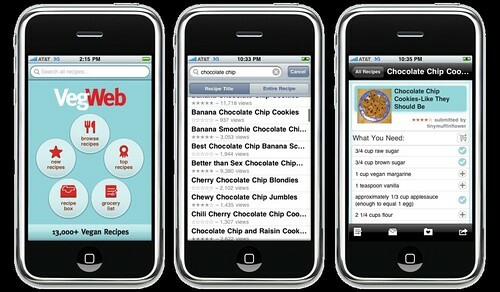 Home » Community » VegWeb-o-Rama » VegWeb Vegan Recipe Finder iPhone app is available! This app is basically like having all of VegWeb.com's over 13,000 recipes at your fingertips at all times. It's the absolute greatest recipe app of all time, and you NEED IT! KAD - yay! so happy you like it!! When do I get a free copy of the finished product for being a tester? Hey gnarls_baudelaire! We're sending those codes out this week! Hey! If you guys are loving the app, please leave a review in the iTunes store! If you're having any issues with it, shoot me an email at laura at vegweb dot com! Will there be a VegWeb app for android phones? Pretty please! I've downloaded the app to my iPod, and am wondering if there's a way now, or will be in the future, to login and sync it with my existing VegWeb account's recipe box, meal planner, etc. Or is the app totally separate from my VegWeb account? utlkn2me - it's totally separate from the website for now but in the future we might be able to connect them! Thank you so very much for this wonderful tool!! I've been a vegetarian for 18 years but a recent vegan, this is an amazing wealth of information! It's useful AND educational and some of the recipes are stepping stones to other ideas! Thanks bunches VegWeb! thanks, mollybug! you're making us blush! Is this app going to be free? I live VERY FAR from North America, but I love your website and that people share their recipes and experiences. I would love to have that app, but can't pay. Is there a chance I can get it (as a tester or smth)? I would love to se the Android app become available!! Add another vote for an Android app! I'd be happy to test it once you have a BETA version. I would like to see the Android app too!